The “Bond Bears” just can’t seem to catch a break. Beginning in mid-2013, there have been numerous calls the 30-year bond bull market was dead. The reasoning was simplistic enough – economic growth was set to return pushing inflation, and ultimately interest rates, higher. Unfortunately, as each year has come and gone, economic growth has failed to return with real economic growth averaging just 1.9% since the turn of the century. Okay…maybe not so clearly. Let me clean this up by combining inflation, wages, and economic growth into a single composite for comparison purposes to the level of the 10-year Treasury rate. 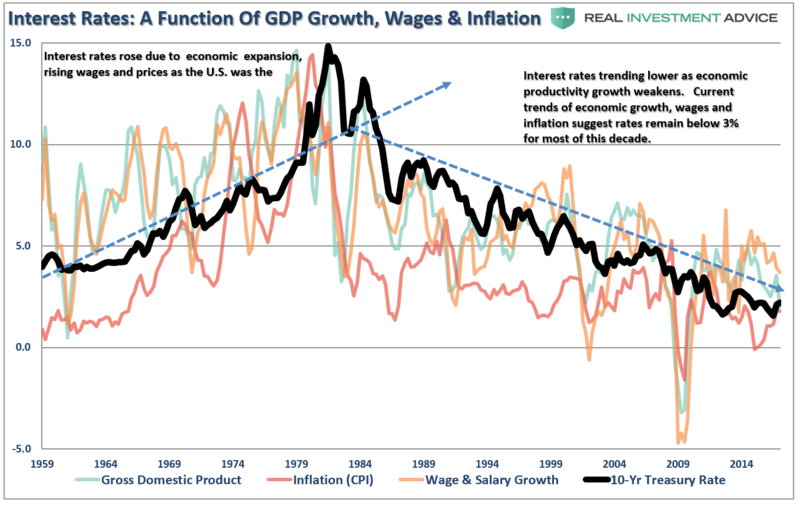 As you can see, the level of interest rates is directly tied to the strength of economic growth, wages and inflation. With roughly 70% of economic growth derived from consumption, the trend of wage growth should not be readily dismissed. It was the analysis of the credit markets that has kept me on the right side of the interest rate argument in repeated posts since 2013. The Fed has mistakenly believed the artificially supported backdrop they created was actually the reality of a bright economic future. Unfortunately, the Fed and Wall Street still have not recognized the symptoms of the current liquidity trap where short-term interest rates remain near zero and fluctuations in the monetary base fail to translate into higher inflation. Combine that with an aging demographic, which will further strain the financial system, increasing levels of indebtedness, and lack of fiscal policy, it is unlikely the Fed will be successful in sparking economic growth in excess of 2%. However, by mistakenly hiking interest rates and tightening monetary policy at a very late stage of the current economic cycle, they will likely be successful at creating the next bust in financial assets. “And if this share price actually did indicate higher economic growth, not just higher profits, then US government bond yields would be rising due to future rate hike expectations as nominal GDP would be boosted by full employment and increased inflation. But that’s not what’s happening at all. Given the current demographic, debt, pension and valuation headwinds, the future rates of growth are going to be low over the next couple of decades – approaching ZERO. Of course, you don’t have to look much further than Japan for a clear example of what I mean. But, for now, Wall Street continues to ignore the giant “secular stagnation” sign staring them in the face.